The 24.54 metre sportfish motor yacht Friendship, listed for sale with bluewater, has been sold with Mike Swartz at Allied Marine Superyacht Division introducing the buyer. Built in GRP by US yard Viking Yachts to an in-house design, Friendship was delivered in 2017 as an enclosed flybridge model. Accommodation is for up to eight guests in four cabins comprising a full-beam master suite, VIP suite, double and a twin, all with entertainment centres, flatscreen televisions and en suite bathroom facilities. Her custom high gloss cherry wood interior accentuates the warm, classic elegance of her saloon andkey features include crown mouldings on the woodwork, comfortable seating on settees and armchairs, a custom desk and an entertainment centre comprised of a 65-inch flatscreen television and a stereo surround sound system. The enclosed bridge has two Stidd helm chairs with bench seating on the starboard side, a large sink and SubZero fridge plus a 40-inch flatscreen television. The cockpit area is where all the action is and comes with all the necessary amenities. These include a Trillion fighting chair with rocket launcher, a tackle cabinet with a barbecue grill on top, a live bait well and six rod holders plus freezer bait trays. A few steps up on the mezzanine deck with teak flooring, there is a table, built-in seating upholstered in buckskin leather, chairs, tackle storage box and a wet bar to starboard. Twin 2,635hp MTU diesel engines allow for a cruising speed of 37 knots, topping out at 42 knots. 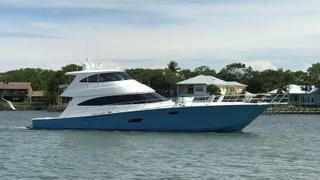 Friendship was asking $5,999,950 and has been renamed Burnin Daylight.